Providers with the Saco Fire Department. Successful candidates are individuals who are dedicated professionals that demonstrate the ability to respond to emergency and non-emergency requests for assistance with a compassionate and caring mindset, and possess the professional skill set that supports safe, efficient, and effective service delivery. The Saco Fire Department is a very active, fire-based EMS and All-Hazards Emergency Response agency with a total annual call-volume of 3,000+ total calls. 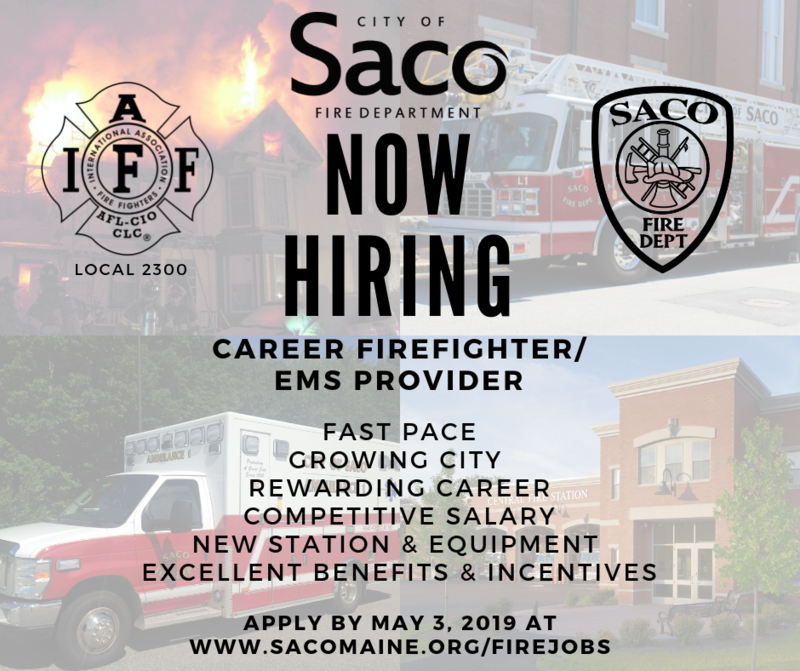 The City of Saco offers a competitive salary, excellent benefits, and a challenging and rewarding work environment that is conducive to personal growth. The Saco Fire Department is committed to enhancing the quality of life for present and future generations of our community. We protect lives and property through Public Education, Fire Suppression, and Emergency Medical and Rescue Services. Applicant must possess the ability to establish and maintain productive working relationships with co-workers, supervisors, City officials, and the public. Knowledge of current firefighting and pre-hospital emergency medical care practices is required. A current Maine EMS License is required; AEMT is the desired minimum. Applicant must possess the physical strength and ability to perform firefighting and pre-hospital emergency medical care duties. Certified Firefighter II (completion expected before the end of the Probationary Period). Maine EMS Licensed Paramedic (completion expected before the end of the Probationary Period). Applicants are encouraged to provide a Cover Letter and Resume for review by the members of the Interview Panel. An evaluation of Firefighting and Emergency Medical Care Skills may be conducted using National Registry Skills Exams or Pro Board Skills Evaluation Stations. A completed Physician Medical Release form must be included with application materials. A description of the Physical Strength and Conditioning Evaluation is attached to this document. The Authorization to Release Information must be included with the application materials to conduct a background check for employment. The City of Saco’s Occupational Health Care Provider administers the preemployment medical evaluation and drug testing. Contact : A complete application will include the completed employment application, letter of intent, resume, and references. Please contact Chief John Duross with any questions at (207)282-3244. Email applications may be submitted to HR@sacomaine.org.